The area in which we stay in Paris is extra-ordinarily multi-cultural and we are continually finding new things of interest there. On our last visit, in September to meet up with Uncle Geoffrey and Auntie Pat, we discovered the Institut de Théologie Orthodoxe Saint-Serge. 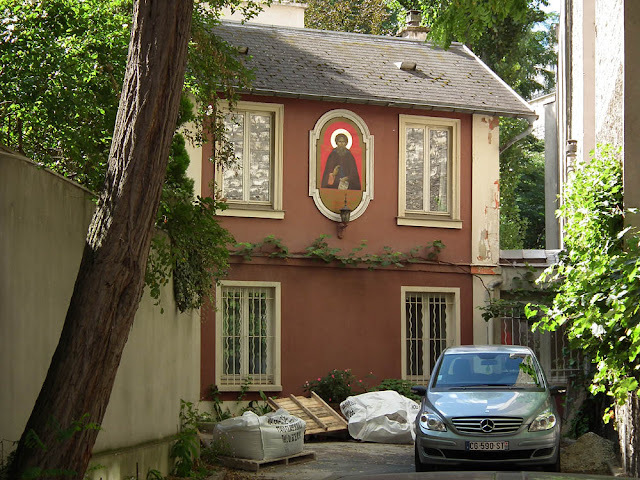 Apparently it is the oldest Orthodox theology institute in Western Europe, and has an important library containing old Russian books as well as modern texts in a variety of languages. There is also a parish church for the Orthodox community and they train priests and theologians to Doctorate level both on campus and through a distance learning programme, as well as run courses on iconography and liturgical singing. This is Part II of an account of an outing to the Foret de Loches by the Association de botanique et mycologie de Sainte-Maure-de-Touraine. Part I is here. 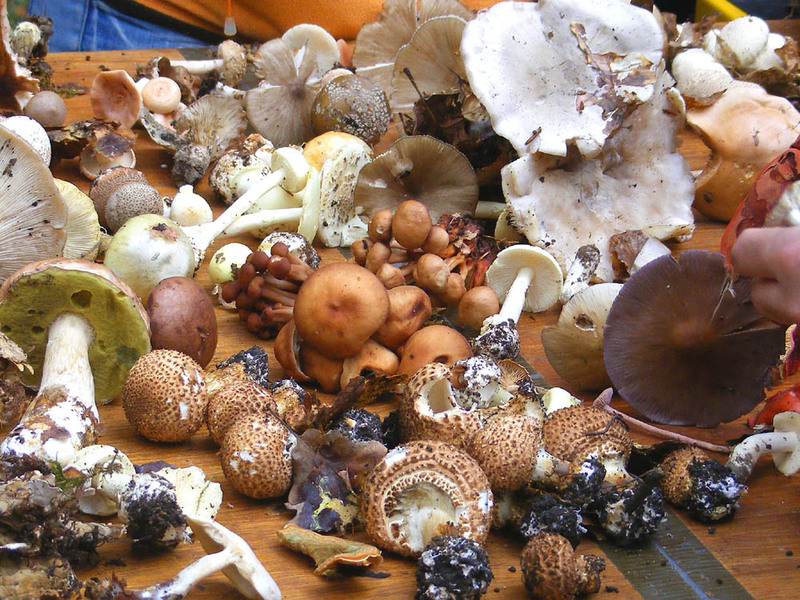 According to Jean-Pierre, we may be in for a very good fungi season. In the autumn following a hard winter or a prolonged period of dry, the mushrooms are often abundant. Since we have had both this year, perhaps we should expect to be overwhelmed by fungal fecundity! I didn't catch what these are called, but they were so pretty I've included them. The final haul displayed, with the crowd of foragers contributing and admiring. Jean Bouton talking to the group about two very poisonous species -- the Death Cap and the Panther Cap. He pointed out that you must check each and every mushroom as it comes out of your basket if you are intending to eat them. 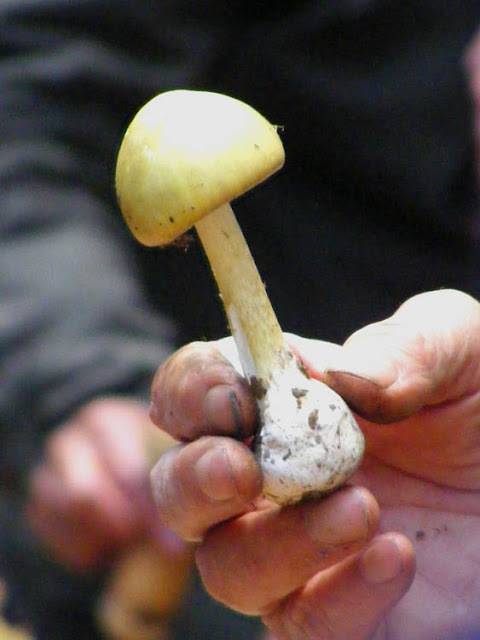 Many of the fatalities caused by the Death Cap have been because it is an unremarkable looking mushroom that gets bundled up with comestibles and accidentally eaten along with the edible ones. 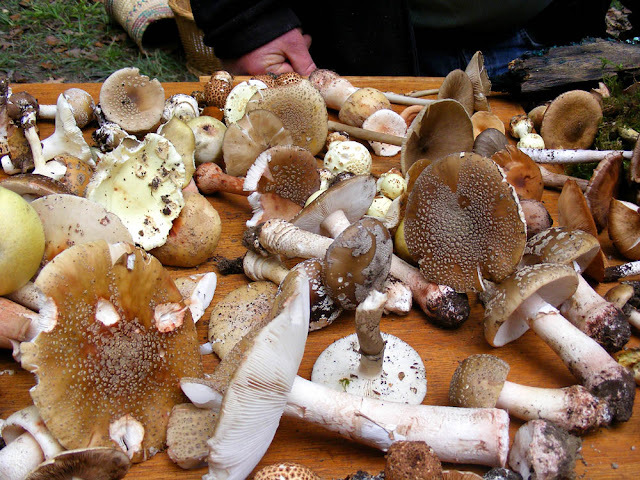 He also pointed out that many mushrooms accumulate substances like caesium and other hazardous materials, so even non-toxic species must be sourced from unpolluted sites. Death Cap Amanita phalloides -- eat a single one of these and you have about 3 hours after ingestion to get medical attention before permanent liver damage or death is inevitable according to Jean. 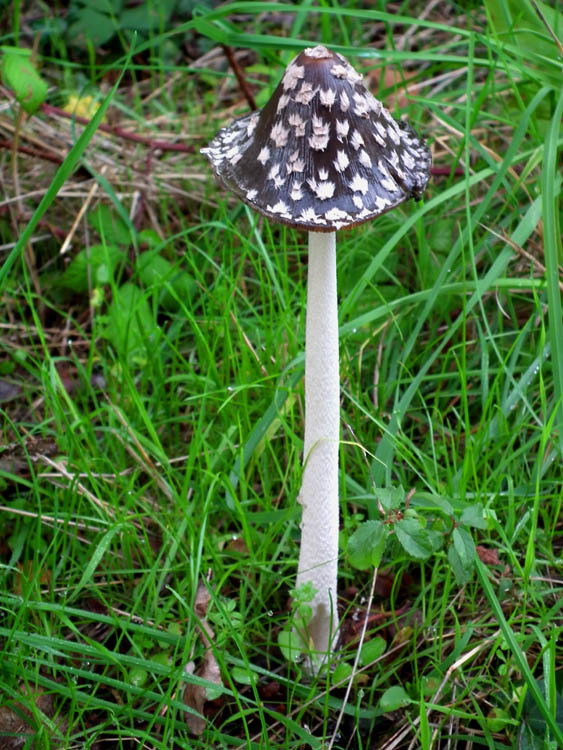 They are the most poisonous mushrooms in the forest, and doubly dangerous because the symptoms of poisoning do not manifest themselves until long after it is too late (several days sometimes). In fact, you are not recommended to even touch them in case you subsequently touch your fingers to your lips and ingest a tiny amount of the poisons (yes, they contain more than one...) nor should you carry them in the same basket as mushrooms you intend to eat. Someone asked Jean about the fact that he openly handled this specimen, but unfortunately I didn't hear his response. These mushrooms are not uncommon, and are the reason that some foragers wear latex gloves. This is a mixture of Blushers A. rubescens and Panther Caps A. pantherina. 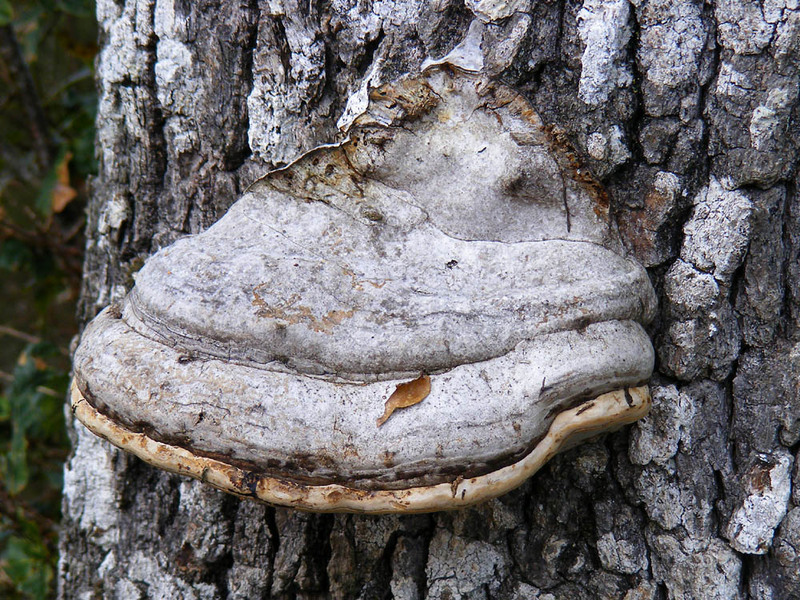 Blushers are comestible, Panther Caps are one of the most toxic species. Can you tell the difference? I think I can, but I certainly wouldn't be putting my health or life on the line by eating any of these, just in case I was wrong. (Blushers get a pink blush on the stem and cap, especially if bruised or damaged, in case you are wondering what the difference is.) Blushers are very common, but Panther Caps are not uncommon here and they often grow in in proximity to one another. The Masters at work -- Paul, Jean-Pierre and Jean identifying fungi at the end of an afternoon of foraging. All the Australian readers will instantly recognise this phrase, but for those of you without the benefit of having studied Australian literature at school, this is a line from the most famous poem written by the most famous Australian poet. 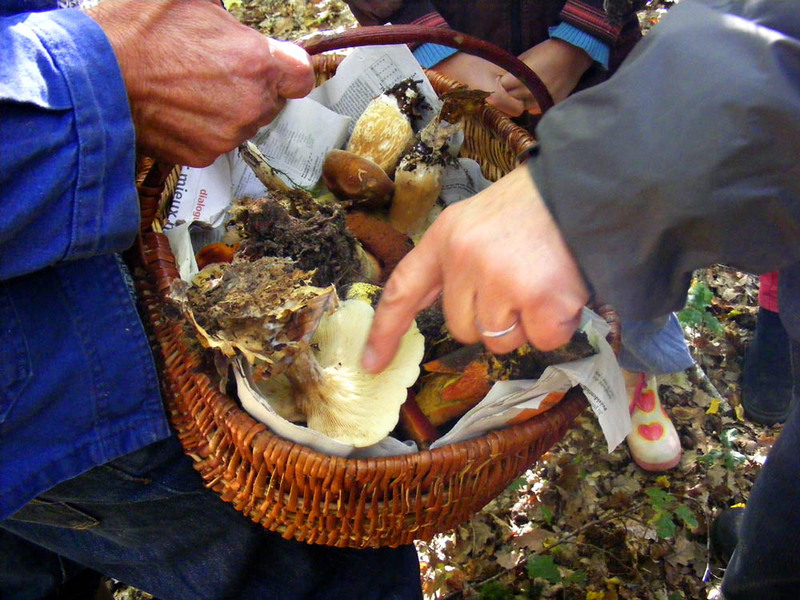 A typical basket of fungi collected on the day -- lots of ceps of several species and a large Clouded Funnel (where Jean-Pierre is pointing). It's what going on my first serious mycological outing in France on Saturday reminded me of. There was a sense of uncommon skills gathered together, eager to play nature at its own game. Unfortunately I didn't take a photo of them heading out into the forest, 60-odd people with trugs, divided into 3 groups. Fortunately, Alex Wild, in an act of total coincidence, posted a photo yesterday on his blog of a recent myrmecological outing that will give you some idea. 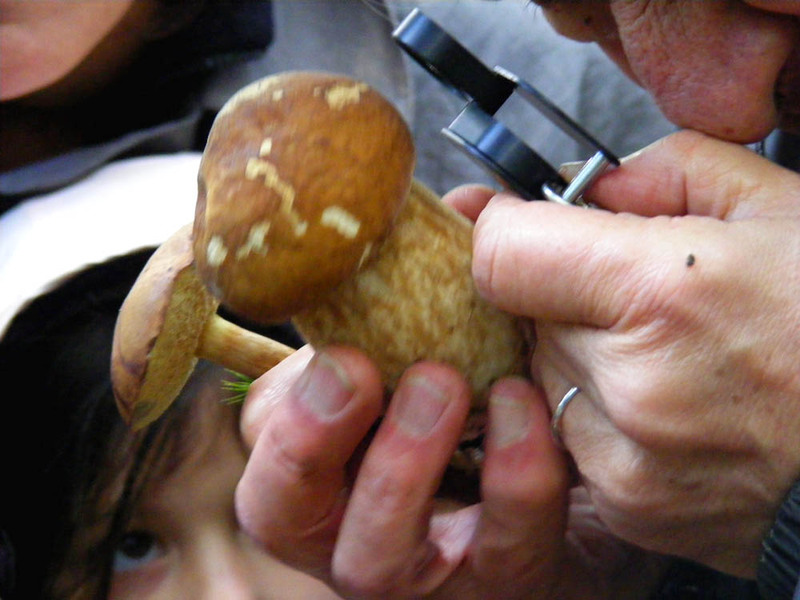 Jean-Pierre examines an Edible Cep Boletus edulis (Cèpe de Bordeaux in French) with a Bay Bolete B. badius (Bolet bai in French) tucked in behind waiting for his scrutiny. Both are prized edible varieties. The outing was organised by the Association de Botanique et Mycologie de Sainte-Maure-de-Touraine, of which I am a member and regularly attend botanical outings. I'm not really a fungi person, but it's always worth going on an outing where there are experts to talk to (this applies to any topic I can think of). 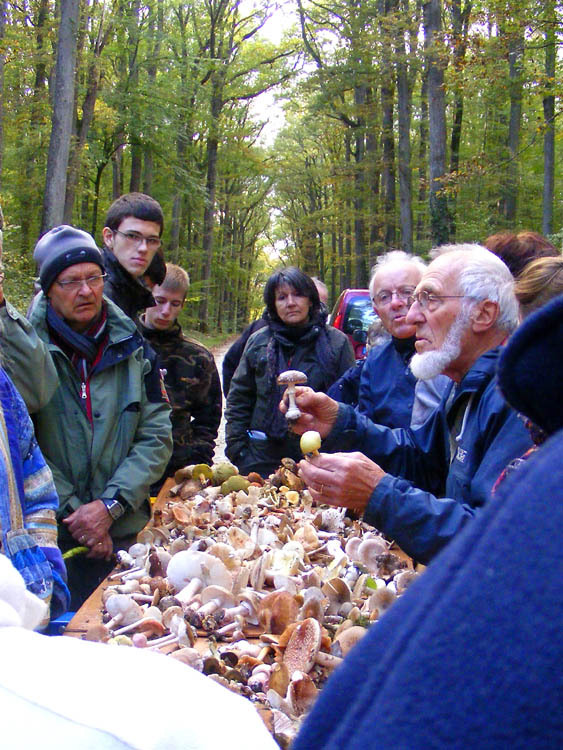 Jean-Pierre talks to a little group about a Clouded Funnel Clitocybe nebularis (Clitocybe nébuleux in French). He says that technically they are edible, but they have such an after-aroma of cat's piss that you probably wouldn't want to. Normally, our spring and summer botanical outings are around 20 people. I think everyone was quite surprised to see 60 turn up on Saturday for the champignons. The age range was from primary school to octagenarian too, which was very encouraging. Everyone took it seriously and were keen to know all about all the specimens we jointly collected. 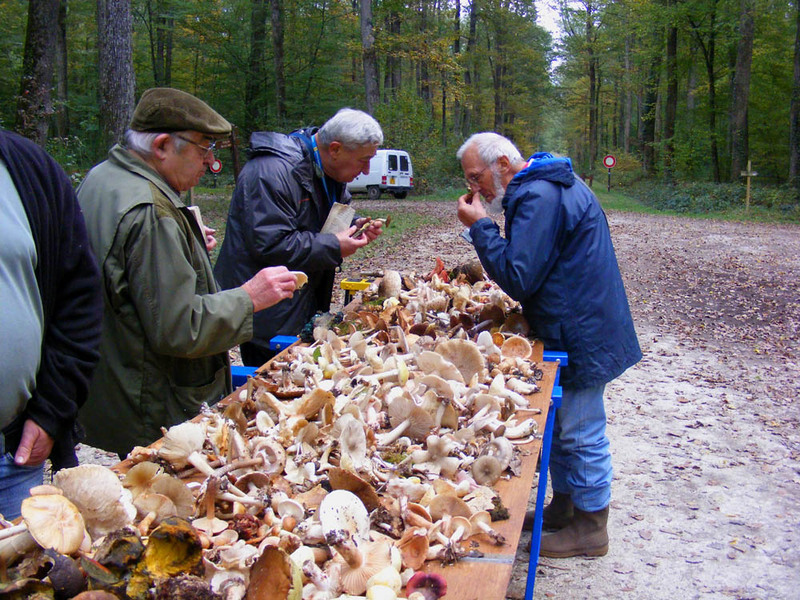 My guess is that mushroom foraging is seen as a very important part of French heritage, and its skills are valued as something that need to be passed on. Rosy Bonnet Mycena rosea (Mycene rose in French). I gather from Jean-Pierre that this is one of the magic mushrooms. Unfortunately, as he pointed out, they also cause serious and irreversible physiological and psychological changes if consumed. They are a lovely pearl pink colour and apparently bioluminescent. I stuck with Jean-Pierre, in the hopes of learning enough to identify a few species reliably. It was really interesting, but the weather turned much colder on Saturday, and my feet got fairly chilly. 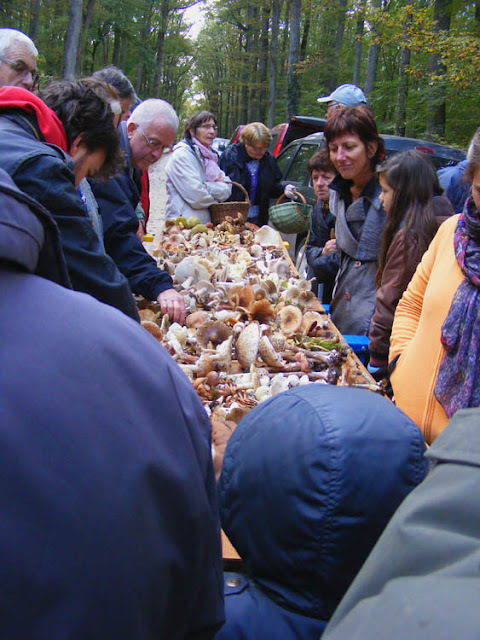 Mushroom hunting is mooching through the forest, rummaging in the leaf litter -- we got barely 20m in an hour, which gives you an idea of just how much fungi there is in this old royal hunting forest. Fortunately we were protected in the heart of the Foret de Loches from the 30 km winds with 50 km gusts from the icy north-east (that's Siberia or somewhere). For me, this was perhaps the most interesting fungi found (by Tim). It is Green Elf Cup Chlorociboria sp. 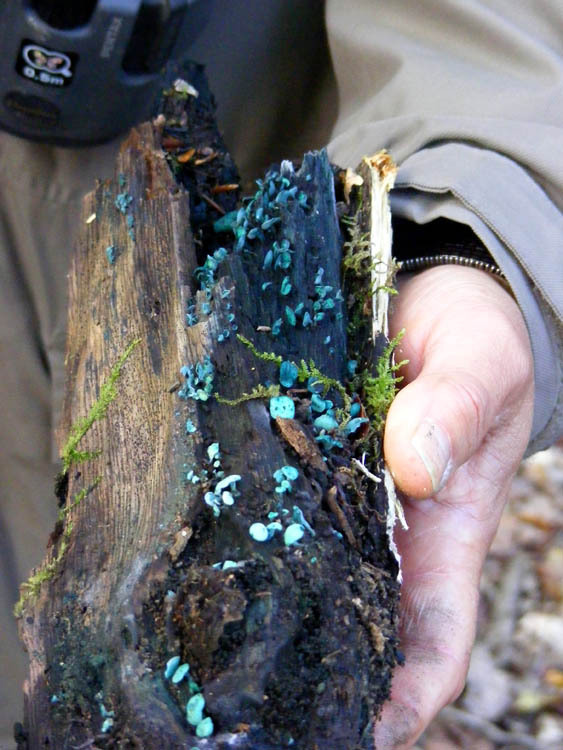 Its presence can be detected even when the fruiting bodies aren't visible, as the mycelia stain the wood they are attacking blue. 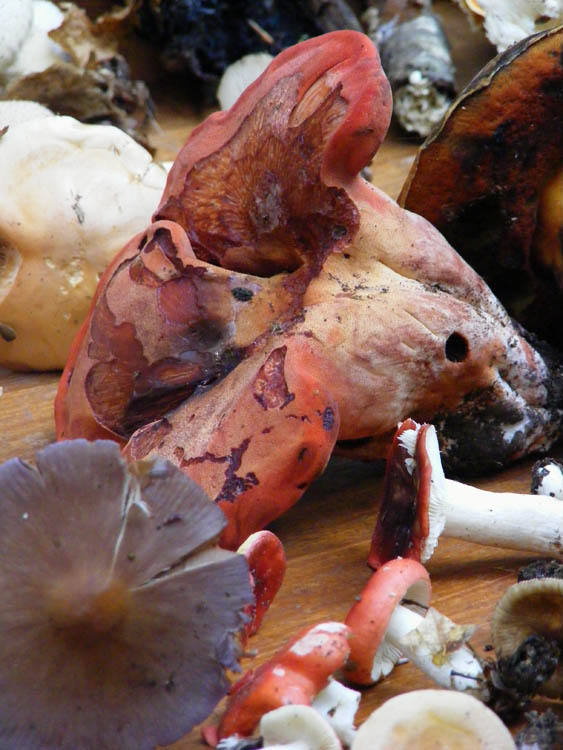 Jean-Pierre pointed out that what we think of as mushrooms or toadstools are really just the fruiting bodies. They bear the same relationship to the fungus as a whole as apples do to an apple tree.The 'mushroom tree' is its mycelia, which live in the soil in synergistic relationships with the plants around them. 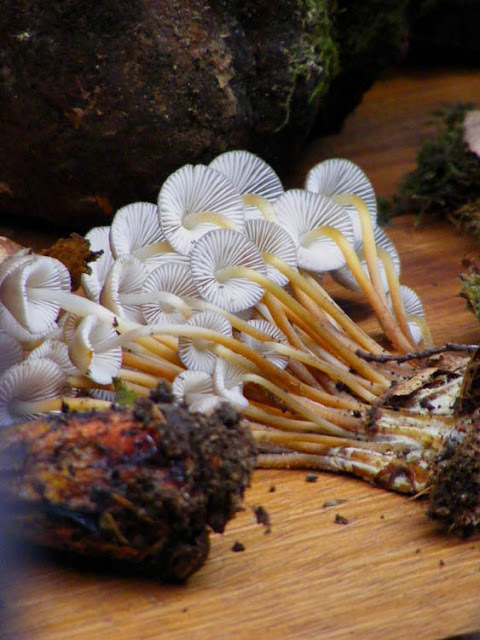 The plants make chlorophyll with their leaves and sunlight above ground, but below ground they absorb minerals and other nutrients courtesy of the fungal mycelia. These far-reaching fungal networks give plants acess to much greater resources and territory than would otherwise be the case. An atypical looking Beefsteak Fistulina hepatica (Langue de boeuf in French). They are not normally lobed like this apparently. UPDATE: Apparently it can have lobes, but doesn't normally grow upwards like this one did. See comment from RonRon below. The mycelia attach themselves to buried wood, sometimes going very deep underground. A succession of fungi will attack fallen branches, causing them to rot and recycling their material into nutrients for the next generation of plants and fungi. The brown rot type fungi start the process, attacking the cellulose in the wood. 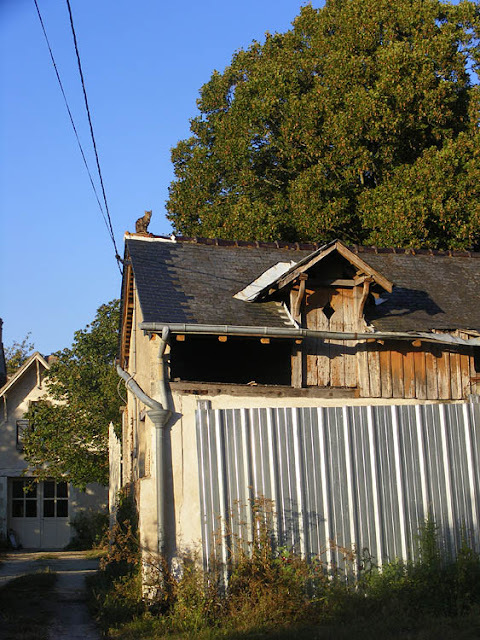 After they have done their job, the white rot moves in, consuming the lignum. This is the reason the forest floor is not littered with dead wood. A small selection of what was collected and put out for discussion and identification. 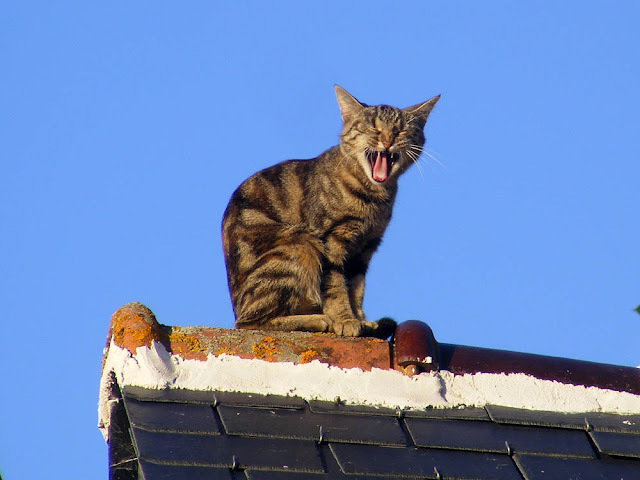 Our neighbours' garage roof is not tin, nor is it especially hot, but it undeniably has a cat on it. The cat in question is one of several that has moved in to our neighbourhood along with their owners this year, more than doubling the cat population in the houses surrounding us. Individually, cats are charming creatures. I enjoy Pepsi's inspection tours and am entertained by Katinka's antics. Sadly, as a species they are problematic. This is not their fault, it is our fault. We domesticated them, we've allowed their population to skyrocket to pest proportions. We have developed all sorts of sentimental attachments to them and anthropomorphised their behaviour, so that sensible methods of control are unthinkable. We don't get them neutered and we allow them to wander at will day and night. Inevitably, some of them end up feral. Despite the fact that we don't own a cat and I am not the most diligent housekeeper, we almost never get rodents inside the house. There is probably a connection between the number of cats in our neighbourhood and the unnaturally low numbers of a highly synanthropic (a wild animal that associates with man) species such as the House Mouse. I'm not saying I want mice in the house, but I know that it is unlikely the cats are just responsible for killing mice. They are small mammal specialists, so I find dead voles, shrews, rats and dormice in the garden from time to time. I also find lizards and snakes, which in all likelihood have been killed by cats. Wild reptiles are extinct in all European cities because of domestic cats. Domestic cats are what conservation biologists refer to as 'subsidised exotic predators'. Their population density can reach more than 100 times that of native carnivores, and around 35% of households own a cat. 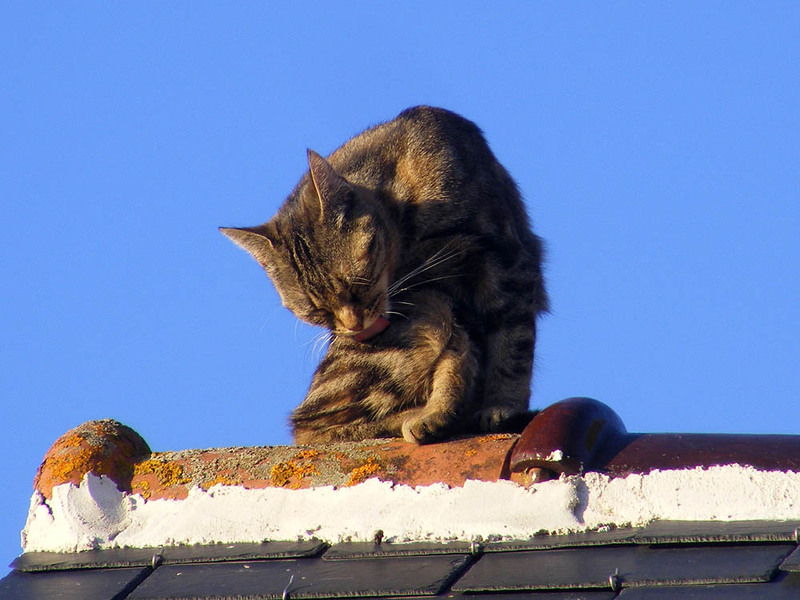 There have been quite a few studies of domestic cat hunting behaviour, all of which show broadly similar results. 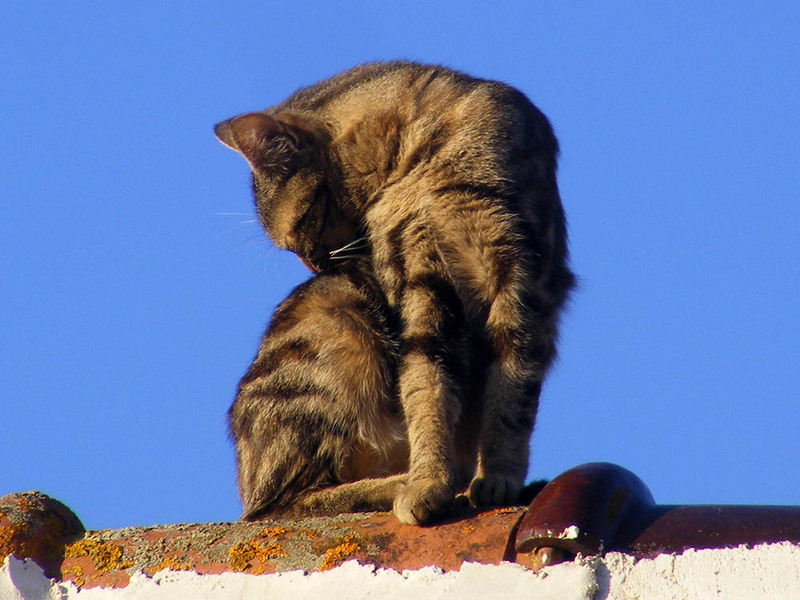 Typically, domestic cats spend between 5 and 9 hours per day outside. About half of these cats hunt, and 70 - 90% of their target prey are small mammals. 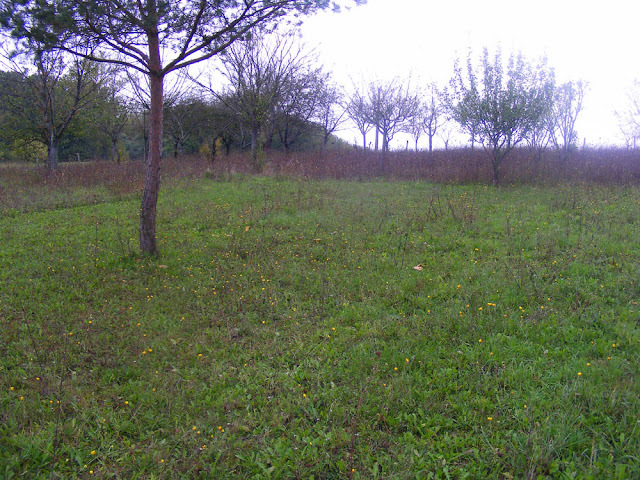 They frequent gardens and nearby land if it is relatively open (for example, pasture or the fringes of sparse woodland). 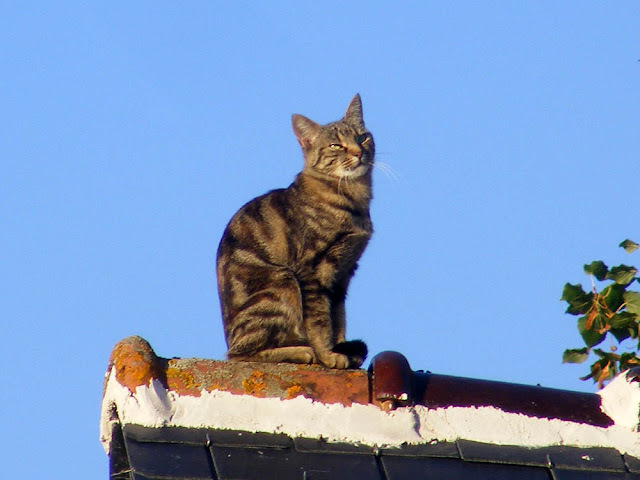 Scientists monitoring hunting domestic cats observe that they hunt about 5 or 6 times more frequently than their owners estimate.They manage to capture prey on about a quarter of their attempts. Half of the prey escapes alive, so their total kill rate works out at around 13%, or about 2 kills a week. This kill rate is more than three times as high as owners estimate. Nevertheless, this is quite an inefficient kill rate, and domestic cats are only responsible for low prey numbers in quite small geographic areas. 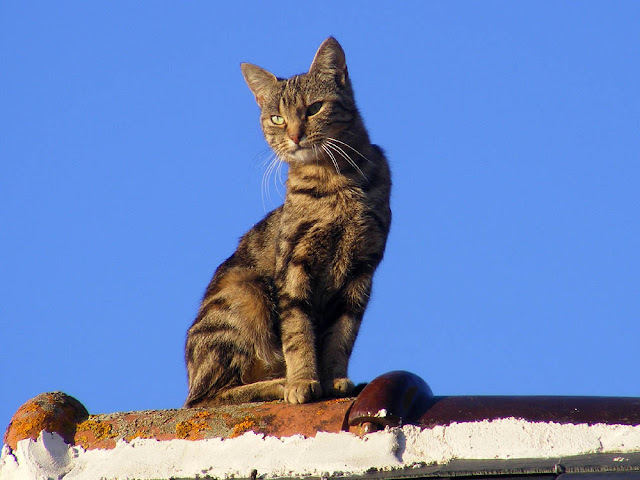 So long as the metapopulation of prey animals is healthy, and the population density of domestic cats not unusually high, they rarely threaten small mammal populations in Europe, where they have been established for centuries. Feral cats, as Australia knows to its cost, are an entirely different matter. They are not 'subsidised' (ie not receiving supplementary feeding) and so are hunting for a living. Just in case you can't make it to the Fungi Foray in the Foret de Loches today, here are some I photographed earlier. These were all taken on a forest trail near Yzeures on Thursday. 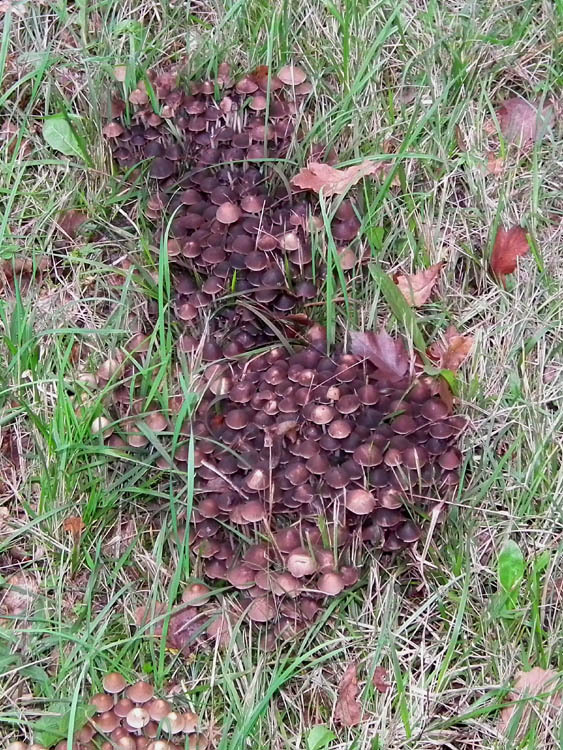 Note that the IDs are tentative, and I am definitely not an expert on fungi. I am only too willing to be corrected (or to have my IDs confirmed) by people who know more than me. This species is apparently difficult to mistake for any other. 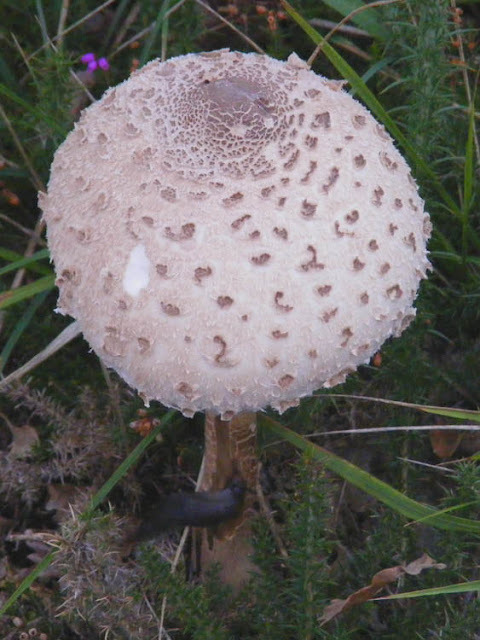 Its only lookalike here is the Shaggy Parasol M. rhacodes, which has a plain stalk -- unlike this specimen which has the brown patterning on the stem typical of M. procera. Parasol Mushrooms are edible and said to be popular for their 'attractive meaty flavour'. I have no idea what this is, but it was one of a group of half a dozen or so growing along a hedge/fence line. It was close to 25 cm tall, and the most striking species we saw on our 7 km walk. UPDATE: Magpie Inkcap Coprinus picaeus. See Tim's comments below. I think this is probably a Hoof Fungus Fomes fomentarius. It infects trees, in this case an oak, already weakened through other causes, and finally kills them. Its alternative name is Tinder Fungus, and from prehistoric times it has been processed to create a material used as tinder for firestarting. It can also be turned into a sort of leatherlike sheet used to make gloves, hats, breeches and other clothing. The 5000 year old corpse of Otzi the Iceman, found frozen in a glacier in 1991 on the Austrian - Italian border, was carrying some of this tinder. 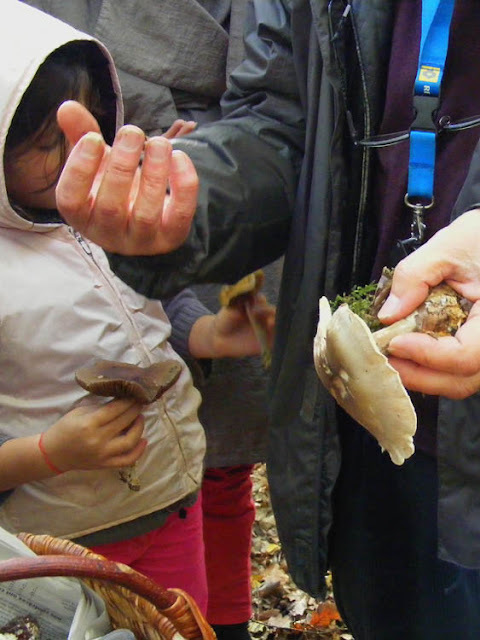 Hoof Fungus is not edible. I think this elfin city is made up of Common Ink Caps Coprinopsis atramentaria. They are supposedly edible, although poisonous if consumed with alcohol. Frankly, they don't look appealing, with or without a nice glass of Saint Nicolas de Bourgeuil. UPDATE: Not Coprinus, but a lookalike Psathyrella sp. See Tim's comment below and the Wikipedia entry for a cautionary tale. 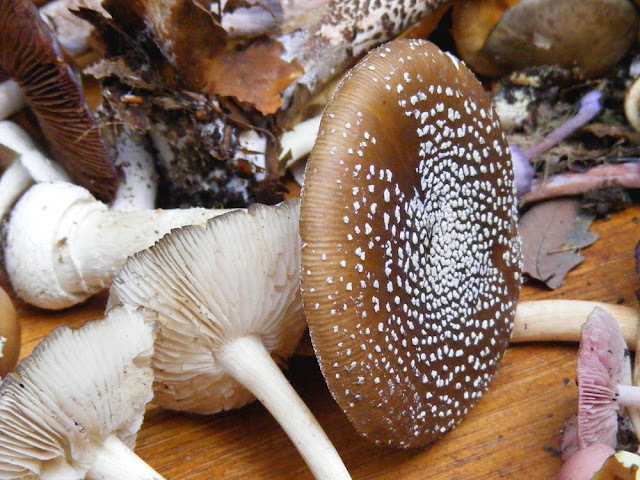 Paul Leroy from l'Association de Botanique et de Mycologie de Sainte Maure de Touraine advises it is Psathyrella multipedata. 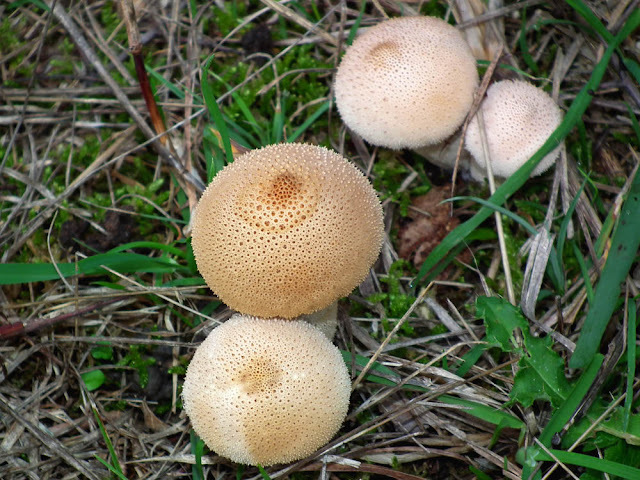 These, I believe, are Warted Puffballs Lycoperdon perlatum. They are edible when young and their solid white flesh has not turned to brown powder. 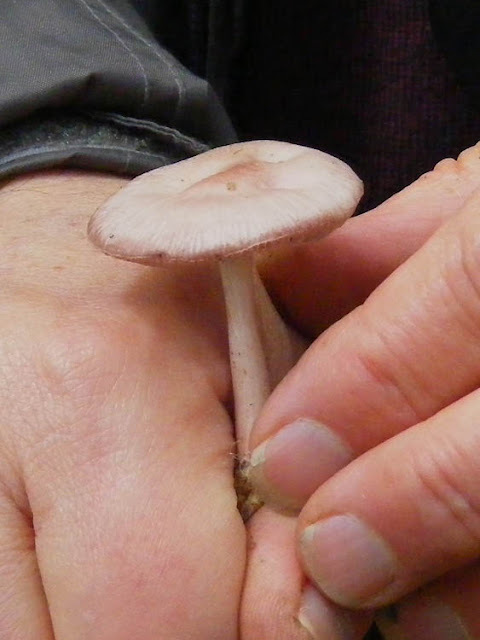 This is a good beginner edible mushroom foragers species, as you can easily test it for comestibility -- cut it in half vertically and check for signs of discolouration after a few minutes or developing gills. If you see neither of these things you can eat it -- one of the few wild mushroom species I have been brave enough to identify and eat by myself. 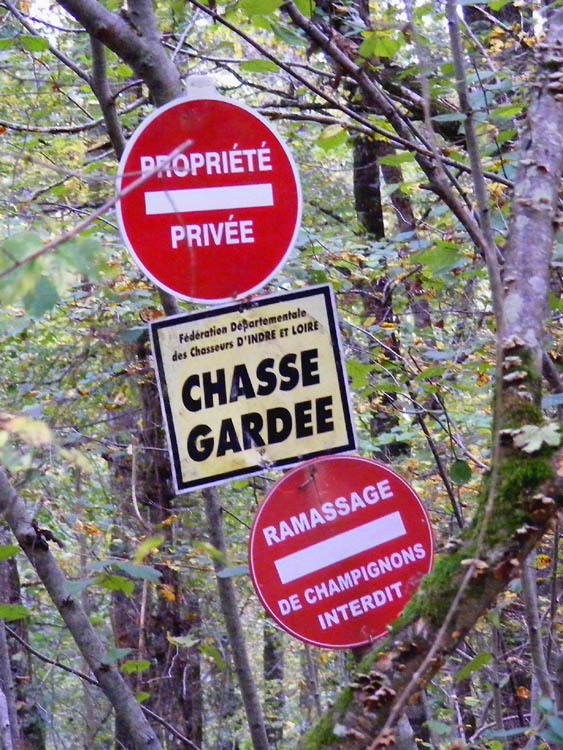 Private property, private hunting, mushroom picking forbidden -- but only if you step off the public path into this person's woods. 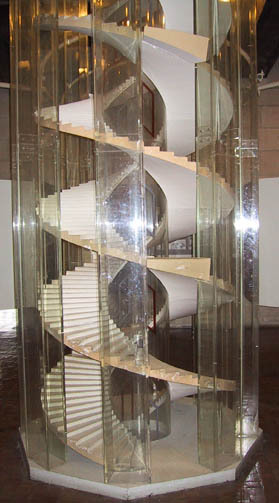 You would never guess just by looking at this photo that this was anything more than an unusually large scale spiral staircase. 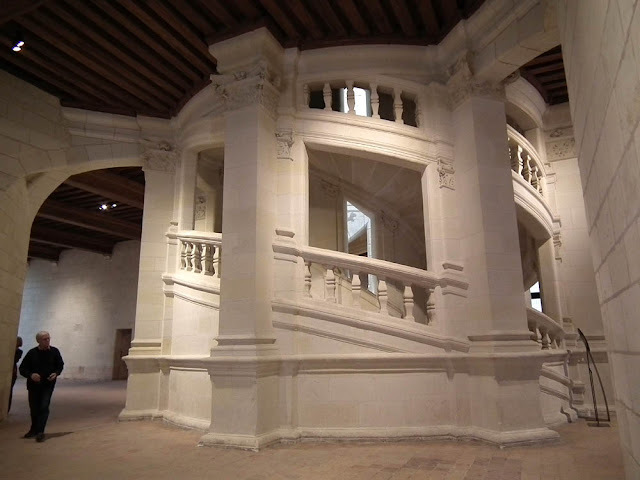 It is, of course, the famous double helix staircase at Chambord, with two separate flights of stairs that coil around one another, so that those on the stairs going up can see others coming down, but mysteriously, they never meet. Seeing the real object, or even setting foot on it and ascending, isn't much help in getting your head around how it works. You need to see a diagram or a model. 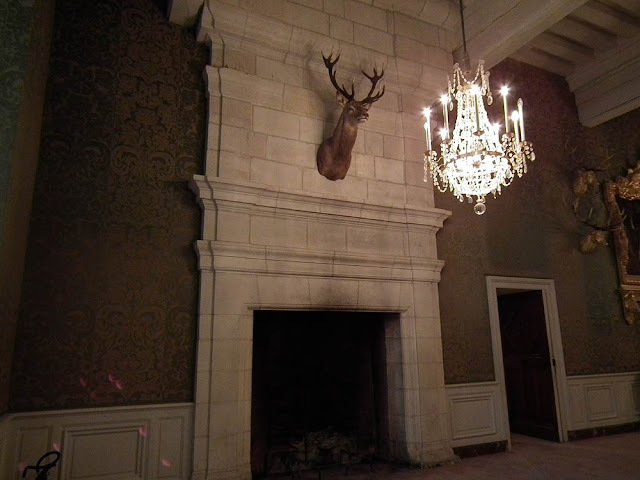 Most of the interior of Chambord is disappointingly 19th century, despite which this photo manages to convey a somewhat misleading impression of understated elegance. The reality is that nothing about Chambord is understated and very little there could be described as elegant -- the scale is too grand, too much about raw power and masculine fantasy. This pair of horses live in the overflow carpark at the Chateau of Chenonceau. The overflow space is usually closed because the main carpark takes several hundred cars and there is no need for visitors to park way over in the horse paddock. However, when it is really busy and the chateau needs all nine hundred of its car parking spaces, the horses are corralled into a corner behind an electric fence for the day. They are joined from time to time in the summertime by horses resting while their horse-trekking vacation riders are picnicking nearby. In early October they were visited by the farrier, who came to check and trim their feet. He was assisted by one of the Chenonceau security staff, someone I normally see scanning tickets at the entry. There is a Fungi Foray on Saturday 27 October in the Foret de Loches. 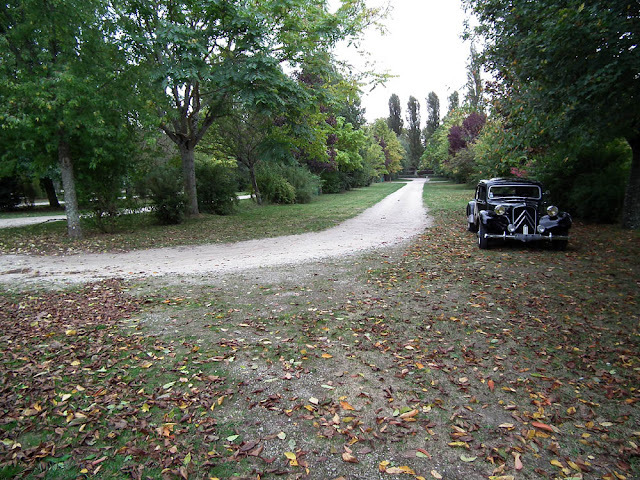 Meet at the Pyramide des Chartreux (the interesection of the D760 and D9) at 2.30 pm. I am planning to be there and there will be expert mycologists to identify all the mushrooms picked at the end of the afternoon. The focus will be on fungi in general, not just foraging for edible varieties. It's rained a lot this October. I don't know exactly how much we've had, but talking to friends and neighbours, it seems to be somewhere in the vicinity of 130 - 150 mm just over this weekend alone (and it must have rained about the same amount the previous weekend). And the temperature is regularly getting up into the low 20s. It is apparently shaping up to be the warmest October since sometime in the 1850s. The grapes from the orchard continue to 'give', as the French say, seemingly unaffected by the warm wet weather and showing no signs of fungal disease. They have a distinctive and strong musky honey scent, very noticeable when Alex mowed and the mower ran over windfalls, and are pronounced delicious by everyone we offer them to. The overgrown and out of control hedge at the front of the potager has been properly pruned, with loppers and a sharp hedge trimmer, not these dreadful flails that the farmers and local authorities use. The pyracantha was a challenge -- Alex got stabbed on the head by a 5 cm spike on a falling stem. I made him put on eye protection to finish the job. We both had spikes go through our rubber boots -- so that's a slow leak next time I have to stand in a stream... Alex was worried the spikes were strong enough to puncture the mower's tires, so Nicole spent some time carefully raking up every bit before he mowed. 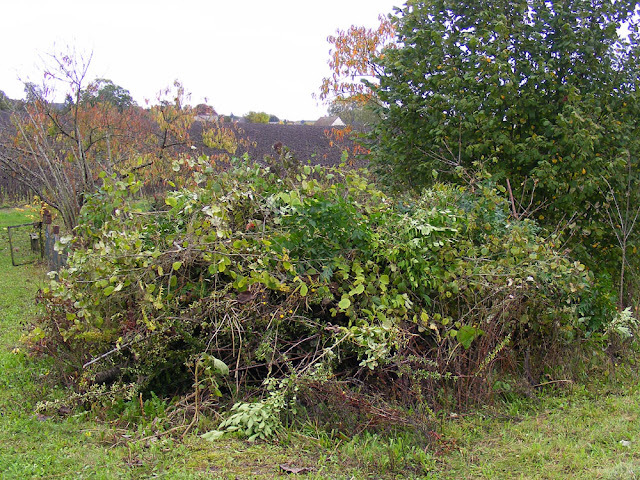 The pile of clippings -- to be burnt one crisp clear day in February. 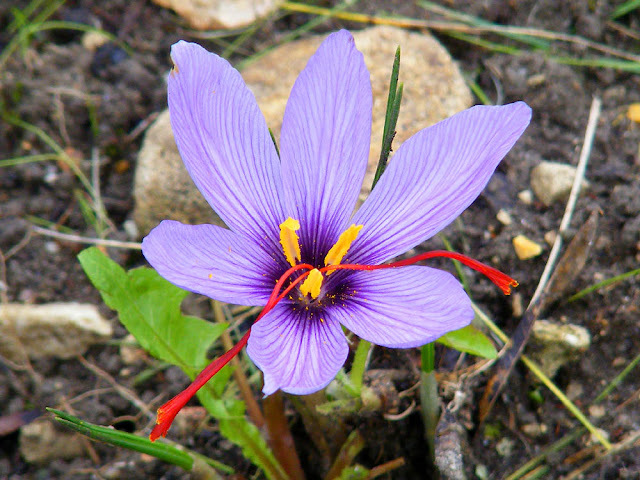 I weeded the saffron bed in the nick of time -- the rain has triggered an almost instantaneous response, and flowering has started. 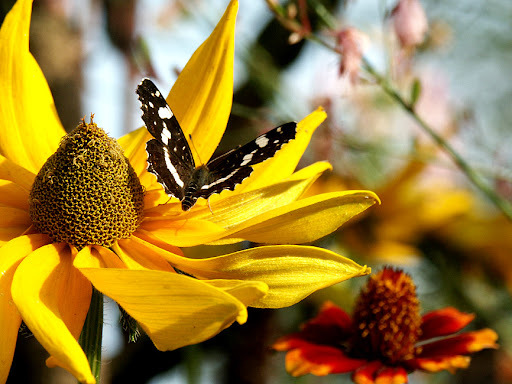 They flower before the leaves appear and must be picked daily. Yesterday there was no rain, and even quite a bit of sun. The predicted few days like that to come will be ideal for them, especially if there is a dew each morning. This one from yesterday is in perfect condition. Probably I won't get more than enough for a single dish, but it is always a thrill to harvest such an exotic and expensive spice in my own garden. 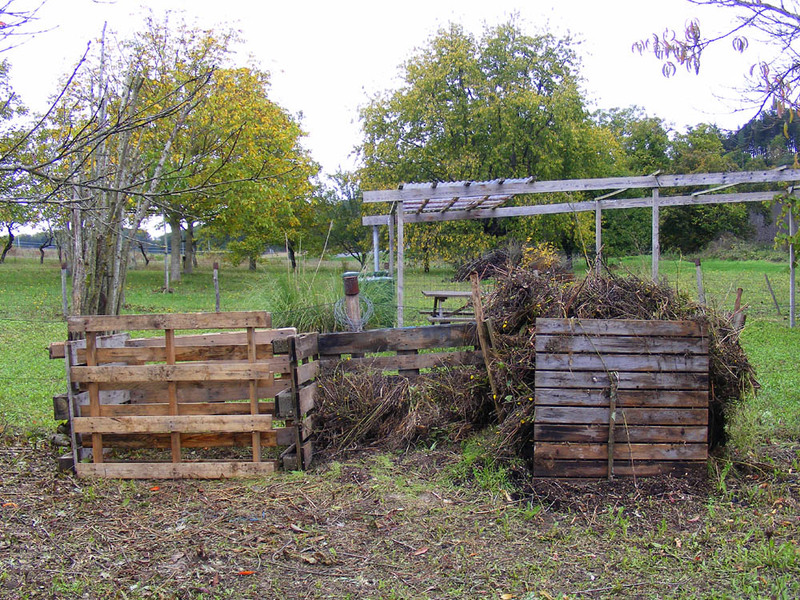 The new compost bins -- a wonder to behold (and will be full depressingly quickly if I get the rest of the potager weeded anytime soon). 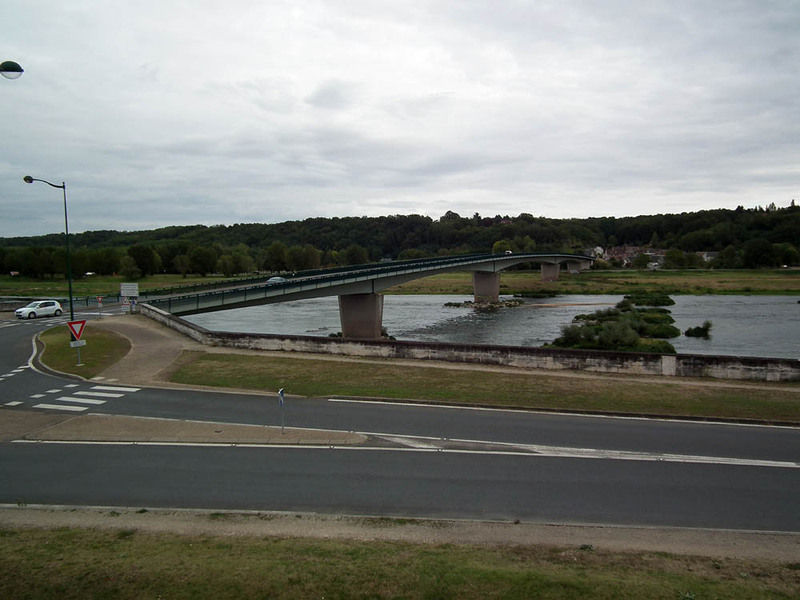 Any bridge that pre-dates World War II in the Loire Valley is a very lucky survivor. Many bridges were destroyed during the War, by both sides, to disrupt troop movements. You can clearly see the remains of the old bridge between Chaumont-sur-Loire and Onzain in this photo - the grassy hummocks in mid-stream mark the old piers. The new bridge is to the left. UPDATE: Simon has just found this excellent page (in French) on the history of the old bridge, with a photo of the damage in 1940. On an iffy early October day only a few weeks after this photo from sunny late September, the carpark at Chenonceau is virtually empty. 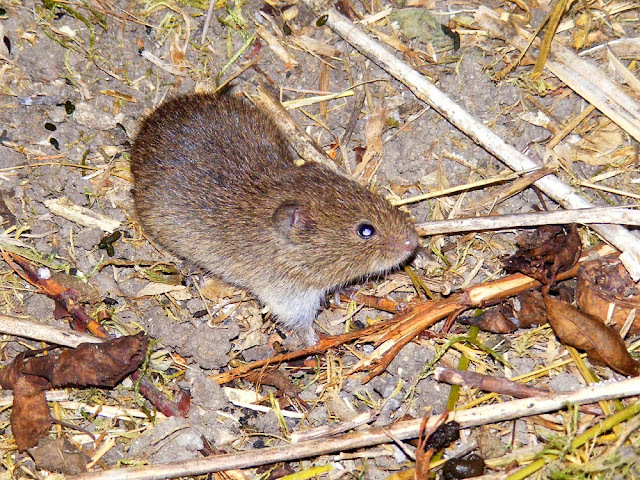 A vole, not sure what species (maybe Common) disturbed when I moved its shelter sheet of corrugated iron so Alex could mow. I also have several photos of where a shrew was. 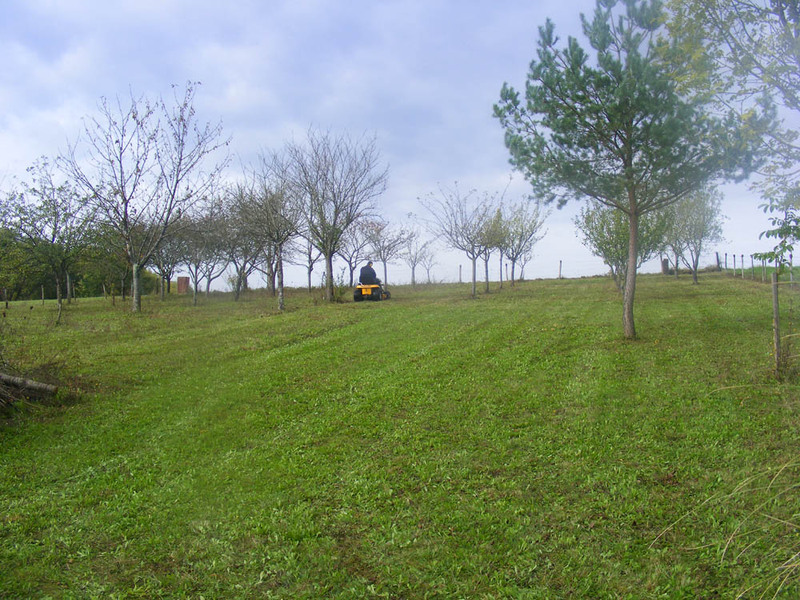 With all the wet weather we've had over this year, the orchard didn't always get mowed regularly, and the potager is a complete weedfest. Added to that all the fenceline hedges were getting too tall and I desperately needed some new compost bins. Time call in the professionals. The section in the foreground hasn't been mowed since July, the rest even longer ago. Our friends Nicole and Alex run a garden maintenance business as well as their gites, and we have used them for various projects in the past (most notably the coin d'apéro). 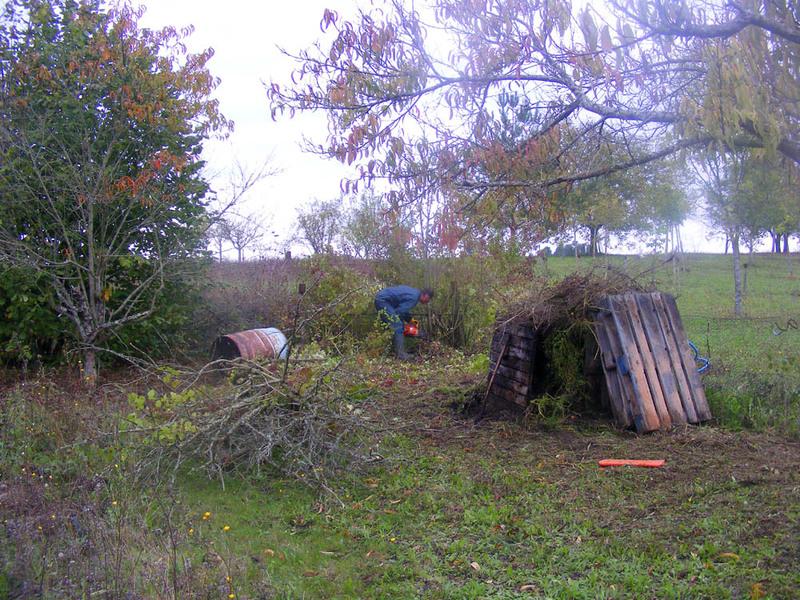 Alex removes the dead hazel tree prior to installing two new compost bins made of recycled pallets. 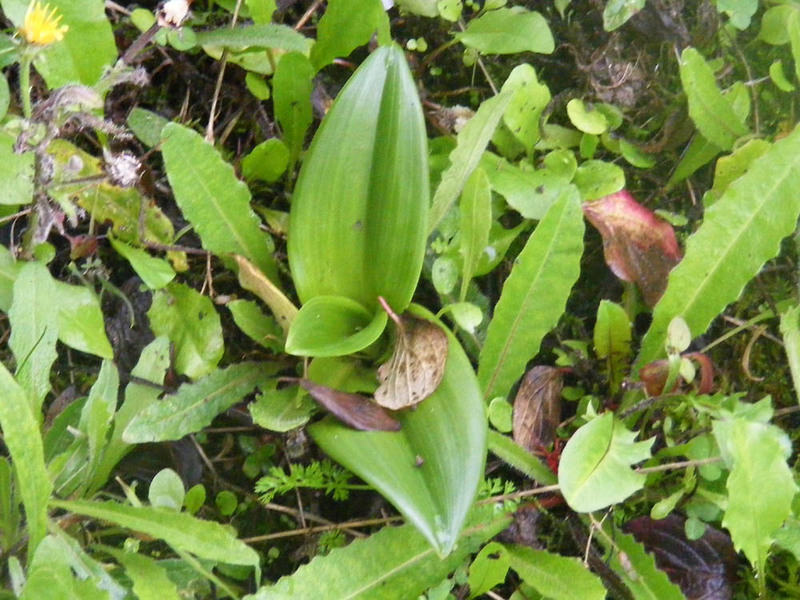 A new Lizard Orchid Himantoglossum hircinum leaf rosette. Last year this orchid had slim strappy leaves and didn't flower. These leaves are more mature looking, so it might flower in 2013. I spent the day down there with them, and while they got on with trimming the hedges, cutting out a dead hazel to make way for some new compost bins, strimming and mowing the grass, I weeded the potager. In the interval between us discussing the work and the appointed day it had been warm and wet, then with a few cold days. The orchids had responded by all sending up leaf rosettes ready for next year. They look very healthy and robust, so I was very pleased. Fortunately they are mostly too low yet to be cut off by the big mower, although inevitably a few got run over. I'm sure they will recover. At the end of the day, you could certainly see where we'd been, but not in too severe a manicured sort of way, which is just how I wanted it. 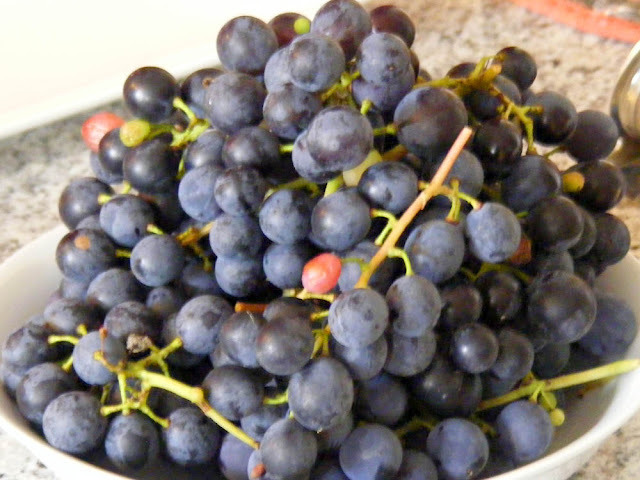 I picked some grapes, which remain in extremely good condition and are sweet and delicious. Some of them I passed on to Alex and Nicole just before they headed off to pick up youngest daughter Amélie from school. Adonis Blue Polyommatus bellargus, male. 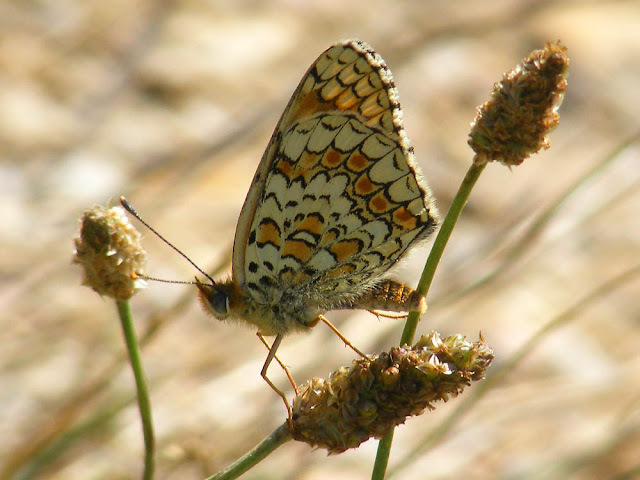 I have just sent off my records to STERF so they can be included in their annual butterfly survey report for France. 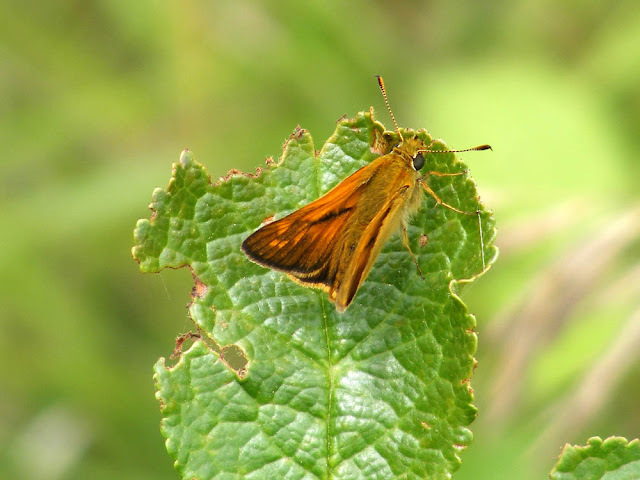 This year the weather was against the butterflies and the surveyors. I didn't manage to survey all my transects every month because if the weather is wet (actually raining), cold (below 16C) or windy (more than 30km/hour) it is not worth doing even in the middle of summer. 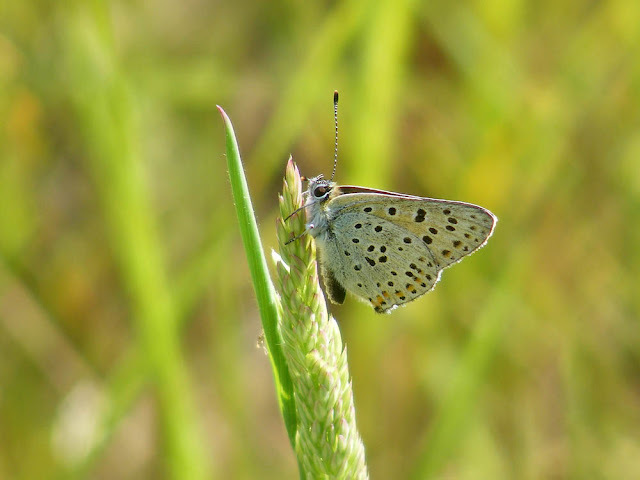 Luc Manil, who co-ordinates the project from the Museum National de l'Histoire Naturelle (MNHN) announced quite early on that it was the worst year for butterflies since 2006. My observation for this year is that now that I look back and compare this year and last year it is obvious how much cooler, windier and cloudier this year has been in comparison. Whenever STERFists go out to survey their transects they first note the temperature, level of wind and percentage of cloud cover. This year my survey days have been about 10 degrees cooler (generally in the low 20s rather than the low 30s). Last year I mostly had a light breeze, this year it has been moderately breezy. Last year it was sunny, this year it has been cloudy or very cloudy. 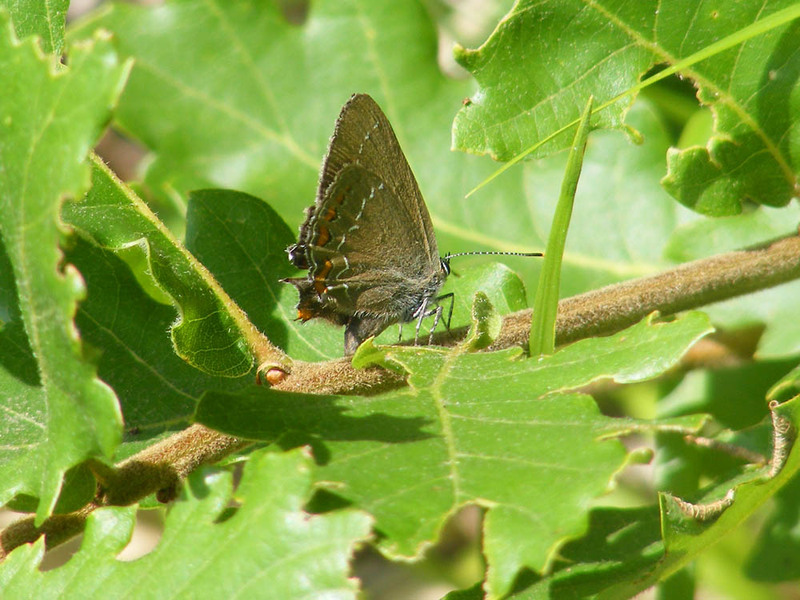 Ilex Hairstreak Satyrium ilicis, ovipositing on Downy Oak Quercus pubescens. 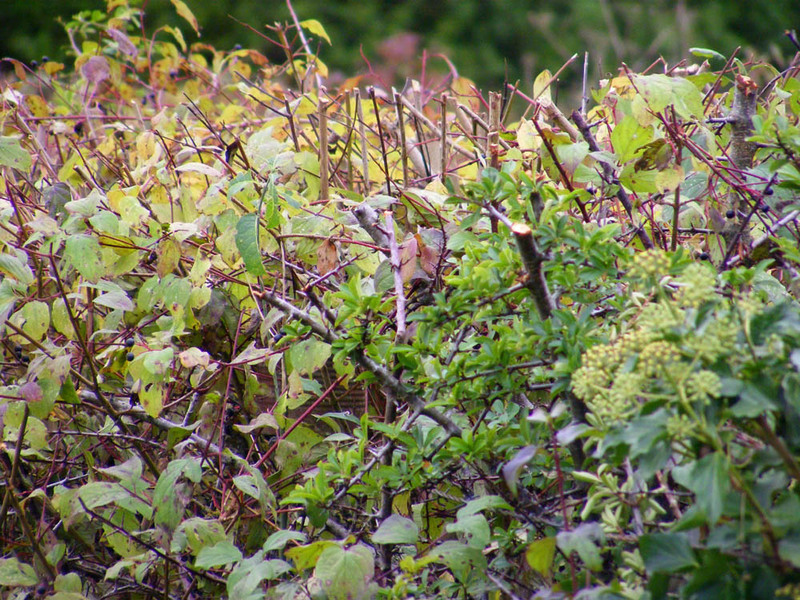 This year all but a few species did fairly badly. 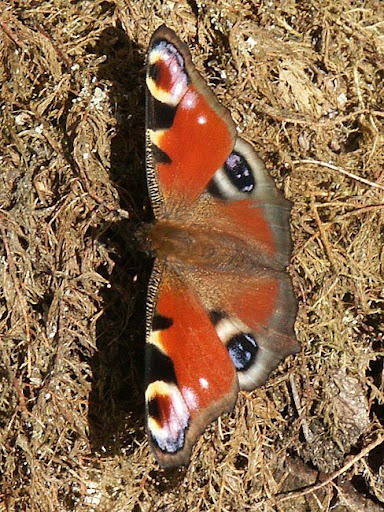 Two of the most noticeable exceptions were the Map Araschinia levana and the Peacock Inachis io. Both were unusually abundant all season. The species that was most noticeable by its absence was the Small Heath Coenonympha pamphilus. This small brown grassland butterfly is normally so common you disturb one with every step, but this year the most I recorded in a single transect was 9. 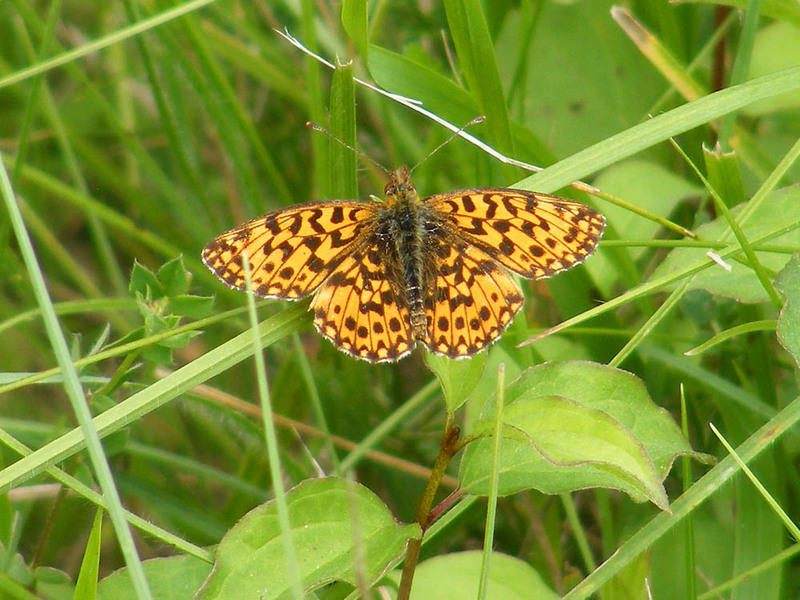 Mostly I saw just a single individual in each transect. 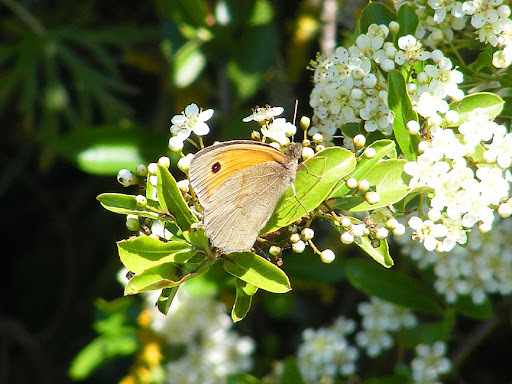 Other brown grassland butterflies, such as Meadow Brown Maniola jurtina, normally the most abundant species in France, were also quite scarce. 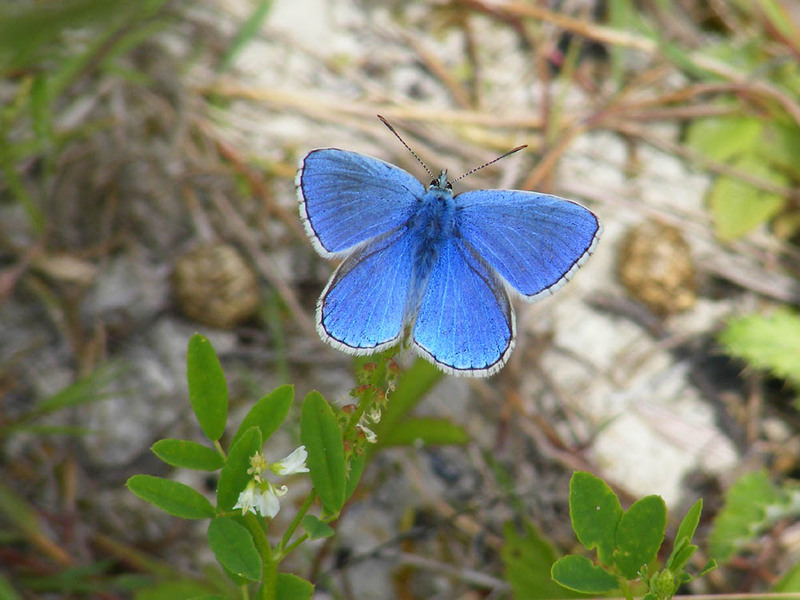 Nevertheless, I did manage to take some very nice photos of butterflies, and I include some of them in this post. 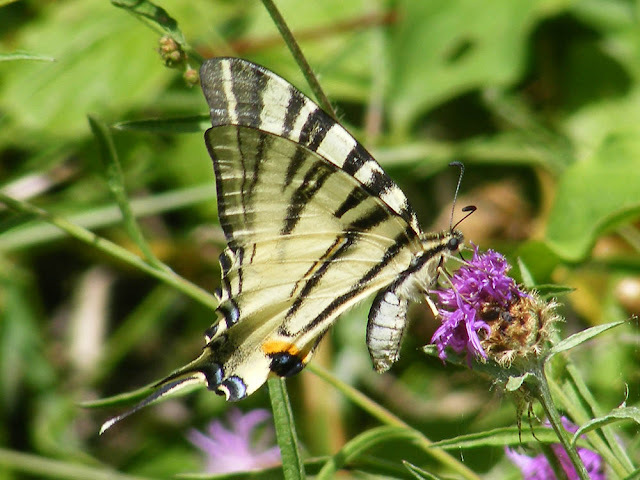 Overall I recorded 696 individual butterflies and 41 different species. Last year I saw more than twice as many individuals, and 4 more species. The most abundant species this year was the Marbled White Melanargia galatea, with 289 individuals, all but 5 of which were seen in June. No other species even came close to this level of abundance, not even the usual suspects, Meadow Brown (last year's winner) and Gatekeeper Pyronia tithonus. 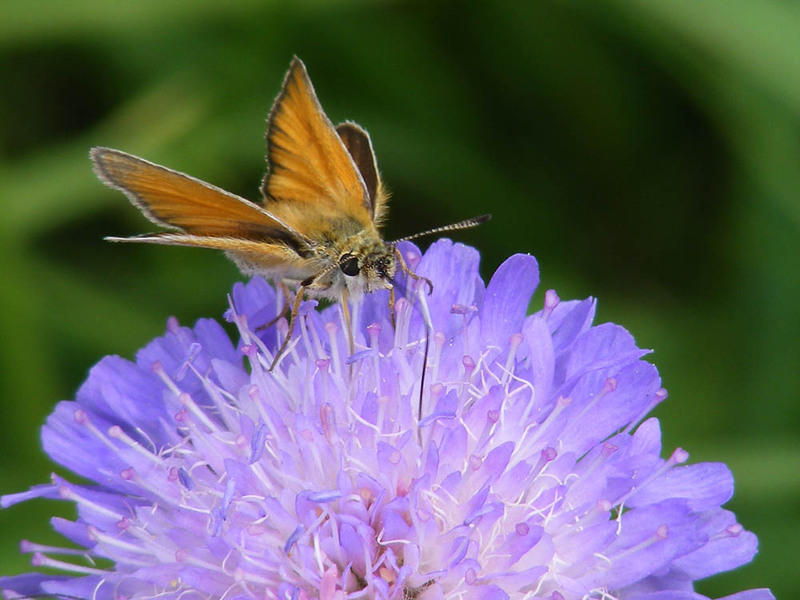 Essex Skipper Thymelicus lineola on Field Scabious Knautia arvensis. You can read my May report here, June report here. For comparison, here is the 2011 overview. 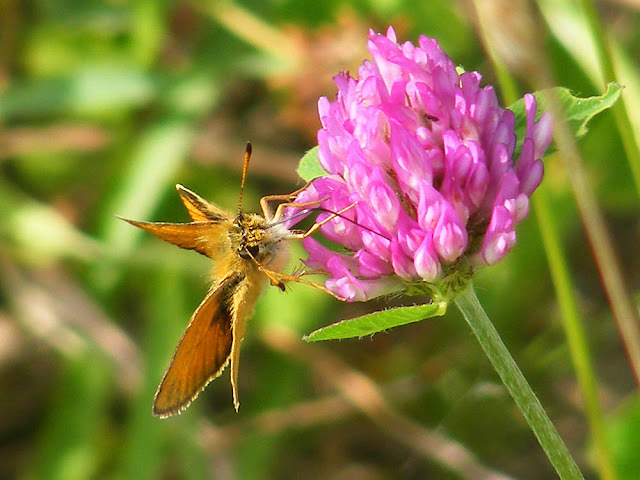 Essex Skipper on Red Clover Trifolium pratense. Knapweed Fritillary Melitaea phoebe on Ribwort Plantain Plantago lanceolata. 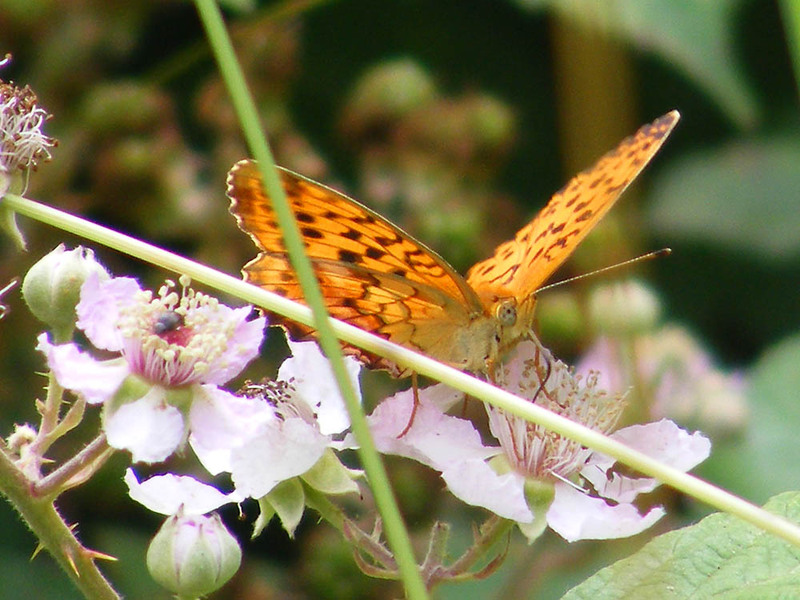 Marbled Fritillary Brenthis daphne on Blackberry Rubus agg. 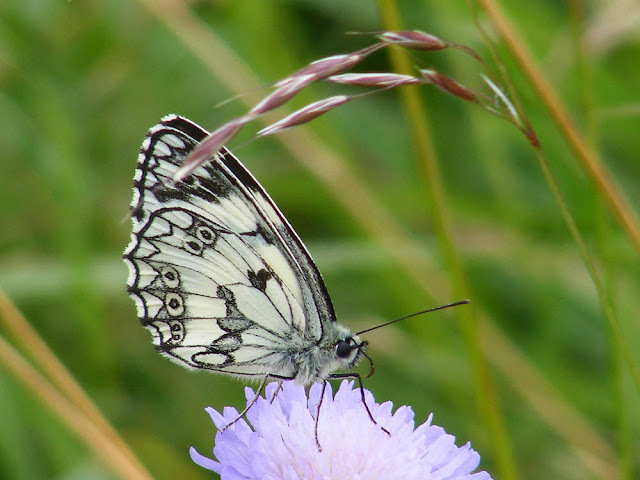 Marbled White male, on Field Scabious. 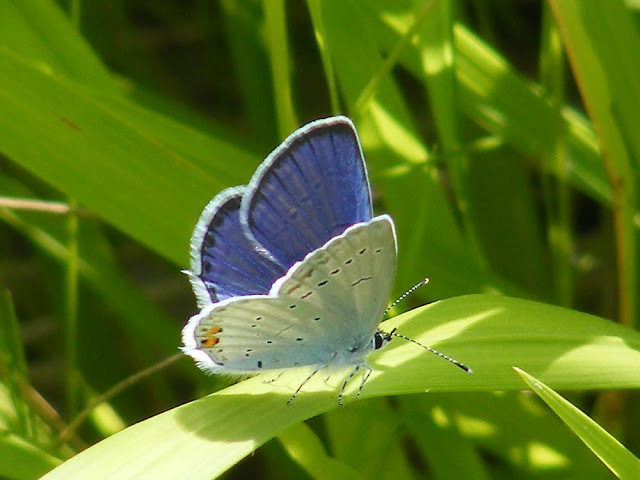 Short-tailed Blue Everes argiades, male. Scarce Swallowtail Iphiclides podalirius on Knapweed Centaurea sp. 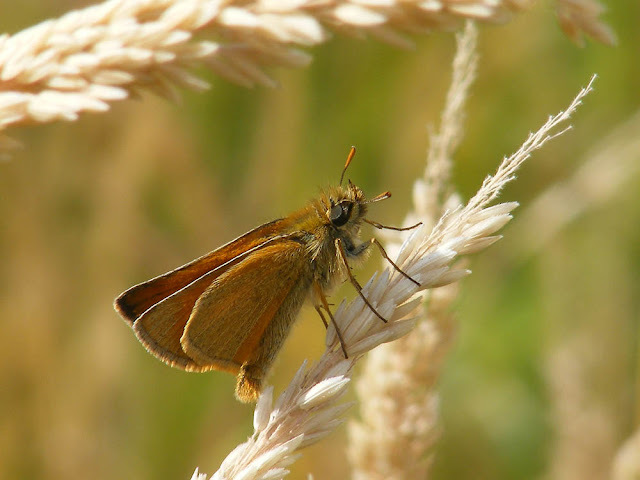 Small Skipper Thymelicus sylvestris on Yorkshire Fog Holcus lanatus.